Basic physics and common sense tells that one should crawl if excessive smoke fills in the adjoining space (mostly in cases of fire). But common sense is quite uncommon in uncommon events. Hence, it is better to get trained for these unfortunate events. It is even better to get trained effectively. After all one has to pay to get trained. So, why compromise? Now, do you know when to STOP, DROP and ROLL? Well, when you are testing a newly bought mattress. But more importantly when your clothing is on fire (and the floor is not). This is not really a complete safety training program. We want to emphasize the importance of methods and approaches. Our blended training approach makes sure that the information gets communicated effectively. Scenarios, stories, graphics, cartoons, slogans etc. add a lot of value to any safety training program. A complete safety training program covers three aspects of safety. A training program may cover all three aspects or a combination of these, as required. Check the circles of safety to understand more about these aspects. Prevention or primary measures forms the first and most important circle in the circles of safety. Given its general nature, it requires first level of customization, as it depends on broad factors such as nature of the job, workplace, region etc. But it is also the most neglected safety aspect.How serious we really are on the issues of safety and security at public places and where does this leave us? 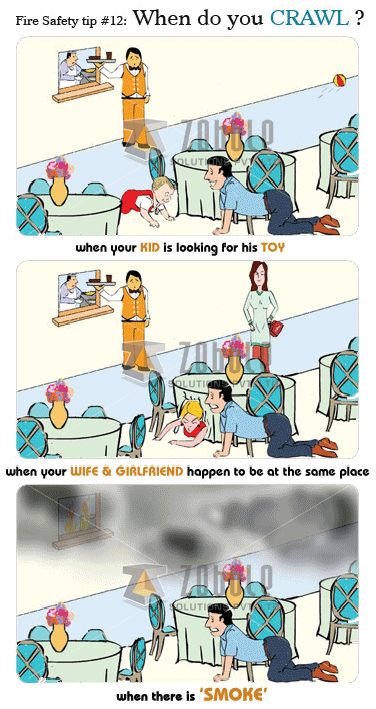 In cases of safety and security, a clear picture emerges. Places like malls, large corporate offices, theatres, exhibition centres, hotels etc. must have an evacuation and rescue preparedness plan at place before an unfortunate event occurs. Evacuation forms the second circle of safety and requires second level of customization. Other than the factors involved in training for prevention it requires more specific details like layout of the workplace, nature and degree of threat etc. Evacuation requires more than pragmatic and intelligent thinking. The person caught in the emergency should be well-equipped with the knowledge about that area. He should also be aware of proper response and possible threats to life for that particular emergency situation. 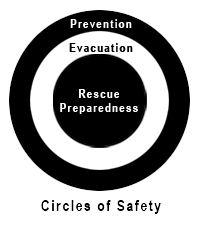 Rescue Preparedness forms the last circle of safety and requires even more customization. It deals with the worst case scenarios where minor mistakes and slight delays can cause damage to life. For the rescue team, each piece of information and its degree of accuracy are vital. As one has to act in a very short time, the communication has to be extremely simple and easily apprehensible. The rescue team has to be equipped with the information about the affected place, so that they can saves lives without putting their life into unnecessary risks. Sample Training Program: Birla Sun Life Insurance wanted to have an effective training program that promotes better engagement from the audience and sensitizes them towards the issues related to safety and security during evacuation. It was to be informative as well educative. The real challenge was to have a training program, which is appreciated by everyone, from managers to peon. Our proposed solution lead to the creation of an Audio-Visual, which was developed using a story format with a touch of humour by bringing in spoofed characters from the hugely popular Bollywood movie industry. Three scenarios on bomb blast, fire and earthquake were woven into one story and the dramatic events made sure that the training had a better recall value with regards to important safety guidelines in case of an emergency. Want to know more about Zobble Solutions Pvt. Ltd. ? click here to request our portfolio.